George Orwell (1903-1950) was born Eric Arthur Blair in 1903 in Motihari, Bengal, India. His father, Richard Walmesley Blair was a civil servant for the British government. In 1904 Orwell moved with his mother and sister to England where he remained until 1922. He began to write at an early age, and was even published in college periodicals, but he did not enjoy school. Orwell wrote about his unfavorable prep-school experiences in the essay Such Such were the Joys (1968). Orwell failed to win a university scholarship and without the opportunity to continue his education he went to Bruma and served in the administration of the Indian Imperial Police from 1922 to 1927 when he resigned in part due to his growing dislike of British imperialism, a dislike he vocalized in his essays Shooting an Elephant (1950), and A Hanging (1931). 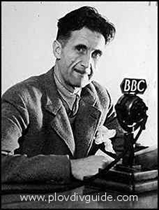 When Orwell returned to Europe he was in poor financial condition and worked low paying jobs in France and England. Finally, in 1928, he decided to become a professional writer. Starting in 1930 Orwell became a regular contributor to the New Adelphi, and in 1933 he assumed the name "George Orwell" by which he would become famous. For his first novel he used his recent experience with poverty as inspiration and wrote Down and Out in Paris and London (1933). While teaching in a private school he published his second major work, Burmese Days (1934). Two years later Orwell married Eileen O'Shaugnessy. During the1930s Orwell had adopted the views of a socialist and traveled to Spain to report on their civil war. He took the side of the United Workers Marxist Party militia and fought alongside them, which earned him a wound in the neck. It was this war that made him hate communism in favor of the English brand of socialism. Orwell wrote a book on Spain, Homage to Catalonia, which was published in 1938. During the second World War Orwell served as a sergeant in the Home Guard and also worked as a journalist for the BBC, Observer and Tribune, where he was literary editor from 1943 to 1945. It was toward the end of the war that he wrote Animal Farm, and when it was over he moved to Scotland. It was Animal Farm that made finally Orwell prosperous. His other world wide success was Nineteen Eighty-Four, which Orwell said was written "to alter other people's idea of the kind of society they should strive after." Sadly Orwell never lived to see how successful it would become. Eileen O'Shaugnessy, Orwell's wife died in 1945 and in 1949 he remarried to a woman named Sonia Browell. Orwell's second marriage was short-lived however, as he died from tuberculosis in London on January 21, 1950.